Enchant your child with timeless fairy tales from a tried-and-trusted Ladybird series. Specially retold to support first reading skills, these are sure to become firm favourites! Each colourful book narrates a classic fairy tale in short, simple sentences, while beautiful illustrations provide visual support and give a fresh take on these traditional tales. As you’d expect from Ladybird, the sturdy paperbacks are produced to the highest standards of quality, while the language is carefully structured to include many everyday words. Puzzle questions at the end of each book also help with comprehension. 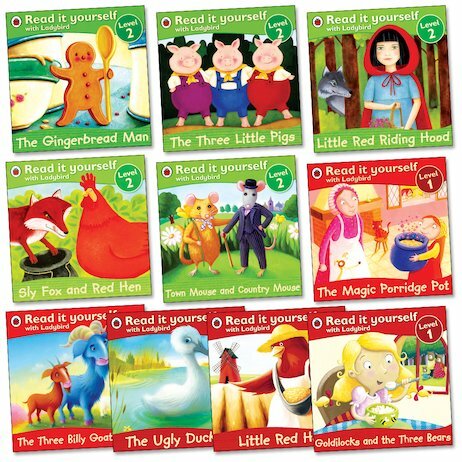 This delightful pack contains five books each from Levels 1 and 2 of the Read It Yourself scheme. Trust Ladybird to help your child become a confident reader!